Aqua villa leaves no detail unnoticed. Handcrafted, artisan touches throughout the home make every detail look like a piece of art, from light fixtures to furniture to unique wood paneling. I was impressed by the gym, which has equipment for every workout. There’s tons of space outside to relax: a sandy cove, large pool, sun deck, and a massive veranda with living and dining areas. You can start each day off with a dip in the sea right from your backyard, or take a short drive to the Tryall Club’s main facilities to do water sports. Drop off children at the Kids’ Club for a truly relaxing day, and enjoy the most beautiful region of Jamaica. 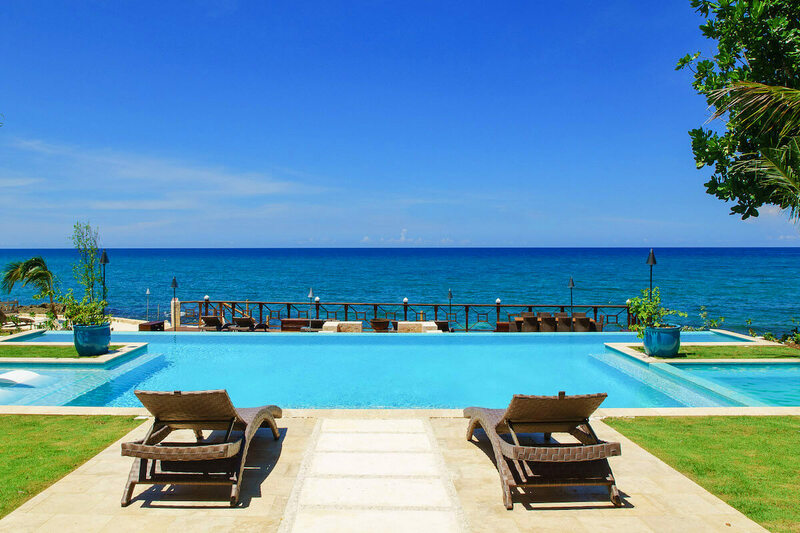 Aqua villa is a luxurious, oceanfront property in Jamaica’s Tryall Club. This vacation rental is so close to the sea, guests can wade in from their backyard. A housekeeper, butler, laundress, gardener, and chef will take care of everything. The villa’s exterior is created for relaxation. The ocean pours into two swimming holes right below the seawall, and a manmade white sand beach is perfect for sun-lovers. At low tide, dive into the zero-edge heated pool or soak in the spa to wash the year’s worries away. Exercise in the lap lane or lay out in the pool’s sun deck. The fully equipped gym has a TV, a bathroom, high-tech stationary bikes, cardio equipment, and weights. There’s a separate massage room with two tables, perfect for a couples massage. Guests can even enjoy friendly competition at the ping pong table just outside the gym. Feast al fresco with an ocean-facing fire pit and an open-air Great Room that lets the sea breezes drift in. There’s dining for twelve and a cozy breakfast nook with a TV. The living and dining veranda leads in to the entertainment room, which has a swanky sitting area with a flat screen Apple TV and driftwood coffee table. Chevron wood paneling and hollowed trunk lamps add chic warmth to the space. The wet bar has the same chevron paneling, with a marbled backdrop that mimics the sea and a collection of retro glassware. The modern kitchen is sure to impress, with royal blue cabinets and an oversized prep island. Colorful dishes and luxury cookware elevate every meal. The den uses a deep blue color scheme to create an intimate cinema experience, and has garden views. This villa rental has four bedrooms, each with an oversized ensuite bathroom. The master bedroom has a king-sized bed and a private balcony with an ocean view. The master bath has a stand-alone rain shower, al fresco shower, and a bathtub. The other two bedrooms also have king-sized beds and share a balcony with an ocean view. One ensuite bathroom resembles the master bath, and the other has a rain shower and bathtub. The fourth bedroom has two queen-sized beds and an ensuite bathroom with a stand-alone rain shower and outdoor tub. Guests of the Tryall Club have access to tennis courts, golf, and a communal fitness center. Children will love the Kids’ Club, and the whole family will love the on-site water sports. There’s shops and restaurants inside the Tryall Club facilities, which are only a 5 minute drive away. Waterfront property. May also walk to the Tryall Club's white sandy beach where you can enjoy the facilities of your complimentary membership. Airport transfers are not included, but can be arranged for an additional expense.